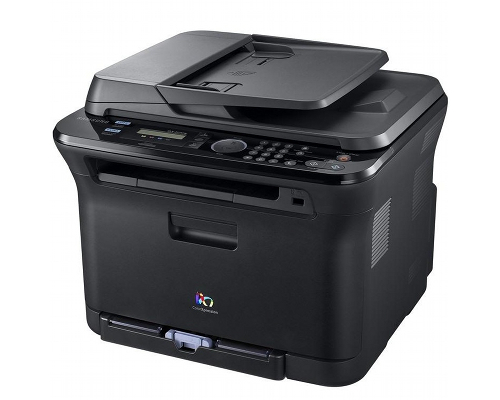 The Samsung CLX-3175 is a multifunction color device capable of copying, printing, faxing and scanning in a small footprint for home office or personal use. Based on its slow speeds and lack of expandability, it offers limited functionality outside of that context, but may work for individuals who need moderate-speed prints at satisfactory resolutions with small paper throughputs. The CLX-3175 measures 13.5" by 16.3" by 14.7" and weighs 33.5 lbs. This makes it more than small enough to fit comfortably on a desk alongside other equipment, like a monitor and keyboard, or in its own cabinet or upon a credenza, if desired. It's compact enough, in essence, to fit most anywhere. 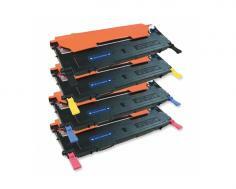 The printer/copier produces sheets at 17 pages per minute in black and 4 pages per minute in color. This is consistent, if not slightly faster, than other Samsung models, but behind the workgroup printer standard of 20 pages per minute established in the early 2000s and well behind the 40-50 page per minute speeds offered by newer industrial systems. It does, however, produce documents at a maximum resolution of 2400 by 600 dpi, more than acceptable for most non-photo applications. The copier supports enlargements and reductions between 25% and 400%. The CLX-3175 will process letter and A4-sized media standard, as well as envelopes, labels, card stock, transparencies, preprinted paper, glossy paper, pre-punched, and recycled paper. Custom documents can be fed between 3" by 6.3" and 8.5" by 14". The 3175's standard input sheet capacity is 150 sheets and its ADF sheet capacity is 15, well under many larger models, which are designed to handle much greater paper inputs. The CLX-3175 scans documents at an optical resolution of 1200 by 1200 dpi and at 1-bit, 8-bit, or 24-bit depth. The CLX-3175 includes 128 MB of memory. This cannot be expanded like it can in both workgroup printers and other consumer printers. The CLX-3175 connects with systems via USB 2.0. The CLX-3175N includes an RJ-45 network adapter, if desired or needed in order to connect the printer to legacy systems or to make it accessible to multiple PCs. A card reader is also built into the printer to make it possible to print documents directly from memory cards, eliminating the step of connecting it and transferring data from a PC. Wireless functionality and built-in network support is available in the CLX-3175FW. The CLX-3175 has very slow print speeds, especially for color documents, that may it worth considering another printer if you regularly produce color documents. 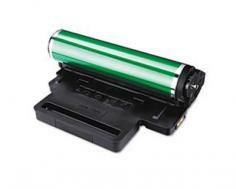 The CLX-3175 has a 150-sheet paper tray with no options for expandability. Because of this, it's extremely difficult to recommend the printer or copier for environments with high throughputs, as 150 sheets is less than half a ream of paper and well under what even many small offices process on a daily basis. Additionally, the 15-sheet ADF makes it difficult to produce large document copies without supervising the printer for at least part of the process, which may be extremely undesirable. The CLX-3175 lacks automatic duplex printing, even with an add-on. Furthermore, it lacks the optional finishing devices offered by many other printing units, such as stackers, staplers, hole punches, book and booklet assembly, and sorting. Environments in need of any or all of these features should seriously consider another device. The CLX-3175 only supports Samsung's SPL-C printing language and no others, which may be a setback for some users, as it means that newer printers' sophisticated support for PDF formats and emulation of older systems will be unavailable, making printing from some systems considerably more difficult. The CLX-3175 includes 128MB of RAM, which cannot be expanded like it can on some other consumer printers and can almost always be in higher-end systems. Review it: "Samsung CLX-3175 "
The Samsung CLX-3175 includes starter cartridges rated at 1000 pages in black and white at approximately 5% coverage and 700 pages at approximately 5% coverage across three colors: cyan, magenta, and yellow. Refill toner cartridges are rated at 1500 pages at approximately 5% coverage for black and 1000 pages at approximately 5% coverage for yellow, cyan, and magenta.